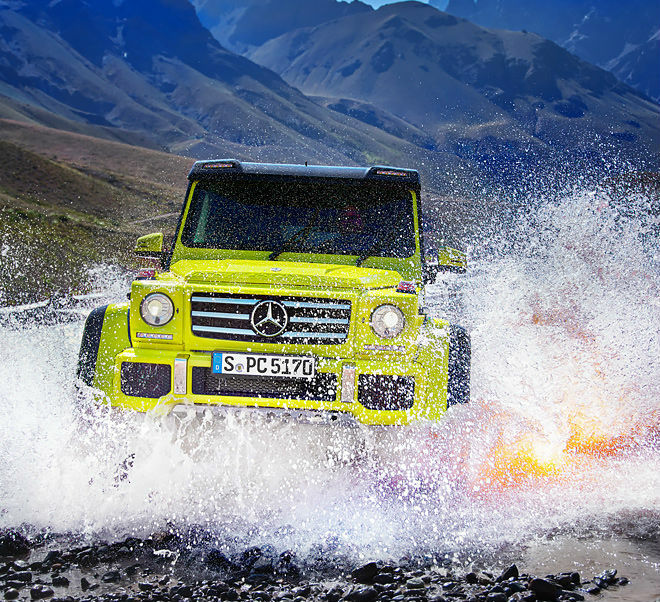 4×4 Squared: Beastly Mercedes G550 Coming To U.S.
A stout trail-breaker that can ford rivers, clear 17-inch rocks, and leap from 0-60 in less than six seconds? It hits American roads (and pocketbooks) in 2017. The 2017 model year G 550 4×4² will land in U.S. showrooms early 2017, according to reports. 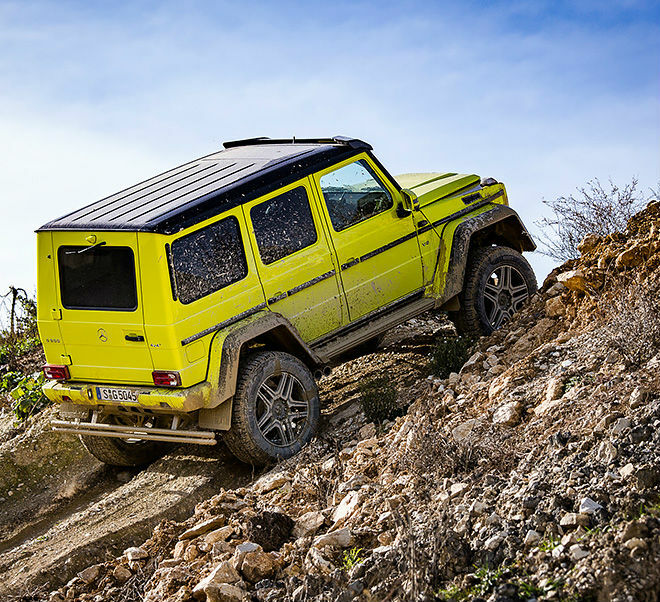 We previewed the 550, marketed outside the U.S. as the G 500, last year when production runs of the beefy cousin to the G-Wagen were mere rumors. News of the American launch dropped this summer. In addition to release date, we now know some of the G550’s performance specs. 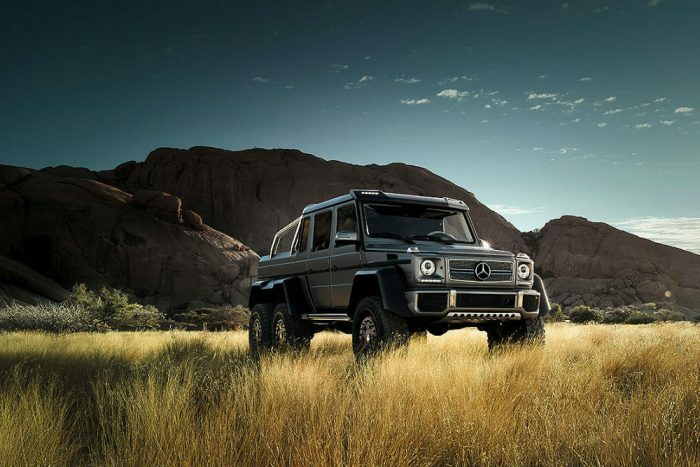 The boxy but stylish off-roader capitalizes on its dinosaur ancestor, the 6×6 (see below). Like its titanic ancestor, the G550 utilizes portal axles, which integrate gears into the wheel hubs, allowing the axle to sit higher and provide greater clearance. That’s how the 550 manages 39.4 inches of water and 17.7-inch boulders without a hitch. The roaring 4.0-liter, V8 AMG engine rips 450 lb.-ft. of torque that harnesses an astounding 416 horsepower. That motor gets thirsty quickly, chugging a gallon of fuel every 17 miles. 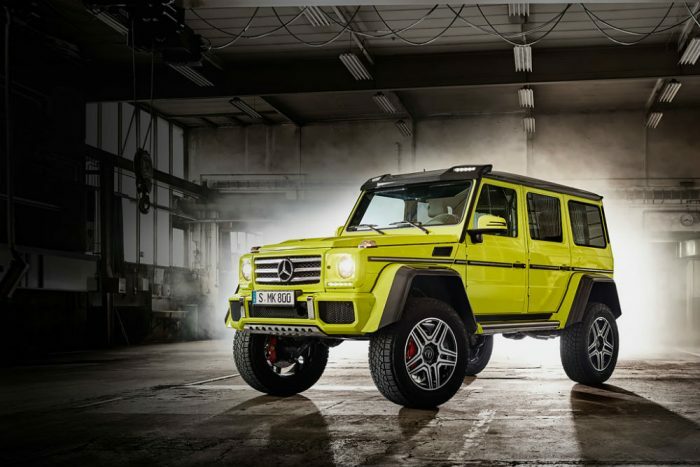 The squat Mercedes sits at 82.7 inches wide, so it’s stable, but it also towers over other SUVs at over 7 feet tall (88.6 inches). But you probably aren’t interested in taking this thing anywhere with rooftops. The only real bad news, then, is the price tag, which as you probably guessed is heavy: over $250,000. From Jeep to Subaru and more, we cover the cars and SUVs of the outdoor adventure world. Subaru Viziv Adrenaline: A ‘BOLDER’ Subaru, or Just More Marketing Fluff?